Artemis has always thought of herself as a modern day Alice, always dreaming of Wonderland. A 'White Rabbit' seconds ago smashed into a school gym and finally provided Artemis with her window into adventure. Well, sort of, because while Superboy, Kid Flash and Robin are fighting an android with the powers of the Justice League, little android flying 'M.O.N.Q.U.I.s' are ensuring Artemis can't help. Using all her skills Artemis is able to battle it out with the attacking forces and as Kid Flash is about to have his spine crushed by Amazo she skillfully fires an arrow to distract the�villain�and buy the team time to regroup and form an attack plan. The boys manage to defeat Amazo by severing his head just as reinforcements arrive. Artemis stares with a longing in her heart. Superboy, Kid Flash, Robin, Miss Martian and Aqualad are a team, a team she would give anything to be a part of. Sadly she reminds herself that Professor Ivo, Amazo and the M.O.N.Q.U.I.s are her father's colleagues. She could never be on the side of good with her father being who he is... right? Artemis is stunned, her dream was literally coming true but the feeling in the pit of her stomach wasn't going away and she accepts on certain terms and conditions; the team should never find out her identity nor who she is related to - ever.�Batman nods in agreement and Green Arrow offers himself as her cover story, her uncle and tutor. The next night in Mount Justice the team is introduced to the new female emerald archer, Kid Flash literally falling over on his face. Artemis grins and realizes her new life has begun. 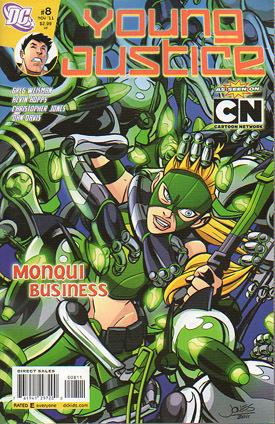 Story - 3: This double-issue tie-in with the episode "Schooled" was nicely finished with the debut of Artemis as an actual part of the team. As a double it works brilliantly, you really feel for Artemis during her internal struggle with her family roots. This issue however focuses mainly on the wham, bam, kablam of the M.O.N.Q.U.I. fight which, while a feast for the eyes was not actually all that interesting. The character driven arc for her character, her affinity to Alice from the Wonderland story, and her eventual welcoming to the fold were far more interesting. The clues to her identity are now all out in the open and though I know who she is and her father, I won't spoil it for anyone enjoying the comic. I would have preferred this issue to stand more on its own with less of a retelling of the episode albeit from another angle as it would have been far, far stronger. Art - 4: The art is crisp and full of vibrant sequences but no matter how fantastic the art, the saturating colors and computer effects swamp it too much. Less digital effects, more pure artwork please! Cover Art - 5: Though I wasn't a fan of the action sequences inside this cover does really show an awesome face off. I love Artemis' expression, you just know these little droid's don't stand a chance!